Taipei, Taiwan, December 2018 – Advantech, a leading automation technology provider, is pleased to announce its UNO-IPS1560-AE power supply module. Designed to ensure uninterruptible power for industrial automation applications, UNO-IPS1560-AE is a lightweight, intelligent power supply module that provides devices with temporary backup power during short-term utility power interruptions/outages. The backup power helps prevent abnormal termination of system tasks and processes, which can lead to data losses and file corruption. To ensure that devices shut down as smoothly as possible, the power supply module also features a countdown timer for initiating controlled shutdown mechanisms. For example, in the event of a power outage that lasts longer than 30 seconds, the UNO-IPS1560-AE module will send a controlled shutdown command to power off the system within 2 minutes. This not only prevents data losses, but also protects the system components from damage, thereby extending the overall product lifetime. In terms of design, the module’s optimized and compact form factor with dual mount (book and DIN rail) support allows for easy installation in a wide range of control cabinets and industrial environments with limited space. Advantech’s UNO-IPS1560-AE power supply module can support a wide input power range of 18 ~ 36 VDC, making it suitable for operation in diverse industrial environments without necessitating an additional power converter or generating increased energy costs. Additionally, the module’s battery can tolerate up to 300 discharge/recharge cycles and is equipped with over-discharge/charge protection to prevent damage to battery cells and ensure safe operation. Designed to support a variety of industrial automation applications, the UNO-IPS1560-AE module features a compact form factor that allows easy installation in a wide range of control cabinet platforms and infrastructure configurations. With the added provision of an all-metal enclosure that supports both book and DIN-rail mounting, UNO-IPS1560-AE can be flexibly deployed according to specific usage scenarios. 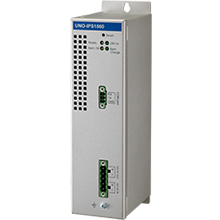 For convenient control and maintenance, UNO-IPS1560-AE is equipped with Advantech’s free software package, which enables users to adjust the time interval before a system shutdown is triggered via an RS-232 command. Moreover, to ensure suitability for a wide range of industrial applications, the UNO-IPS1560-AE module supports the Microsoft® Windows 7/8, Windows Embedded Standard 7, and Windows 10 Enterprise LTSB operating systems, allowing easy integration with existing systems. Advantech’s UNO-IPS1560-AE uninterruptible power supply module is available for order now. To obtain more information about this or other Advantech products and services, contact your local sales support team or visit the Advantech website at www.advantech.com.